Joints and edges between barrier materials are at risk for water penetration. Transition strips create impermeable barriers which protect these vulnerable areas from the water. Mar-flex’s ArmorFlash Transition Strips are versatile and designed for use with Mar-flex’s Geo-Mat and Geo-Mat+ drainage products as well as our ArmorAir Barrier products. 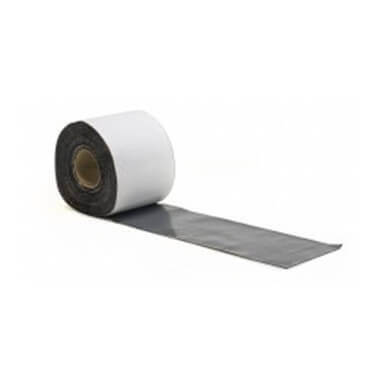 ArmorFlash Transition Strips are self-adhering, cold applied, smooth surfaced, modified bitumen sheet membranes comprised of 36 mils of rubberized asphalt integrally bonded to a 4 mil film of high-density cross-laminated polyethylene. The minimum thickness for ArmorFlash Transition Strips is 40 mils. The strips should be located at beams, columns, changes in substrate material, and similar joints or connections to provide continuity of the air/vapor barrier assembly or drainage product. The strips are 75′ long and are available in 4″, 6″, 12″, 18″ and 24″ widths.